Thursday is officially the new Friday! 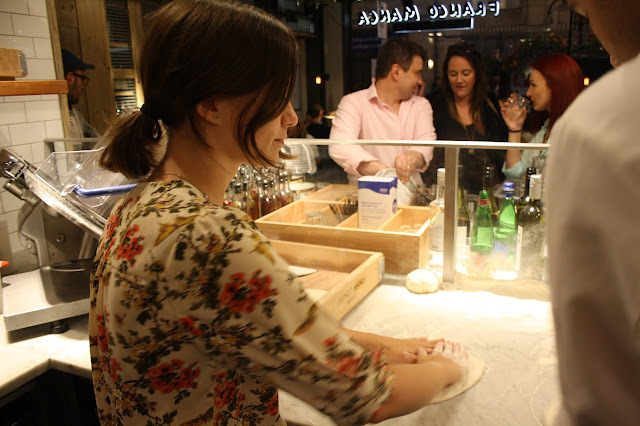 Well, it definitely was for me last week as I was invited to attend a press event, celebrating the opening of Oxford's very own branch of Franco Manca - home of the sourdough pizza specialists! Anyone who frequents Oxford city centre will know that if George Street is short of anything, it sure isn't Italian restaurants. You can snag a pizza at Bella Italia, Zizzis, Ask Italian, or Pizza Hut, to name but a few. Therefore, a new pizza joint in this area has to do something pretty special in order to stand out. 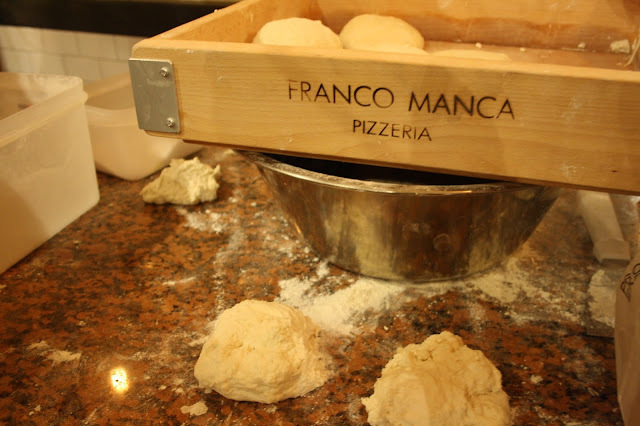 Thankfully, that's exactly what Franco Manca has to offer! Keep reading to find out exactly why I'll be recommending this scrumptious stop-off! Our evening started on a very good note - a warm welcome from Franco Manca staff was followed by an Aperol spritz cocktail, a delicious concoction of prosecco, soda water, and Aperol apéritif. Cocktail in hand, I seized the opportunity to whizz around the pizzeria to take a few snaps before the other journos and bloggers arrived! 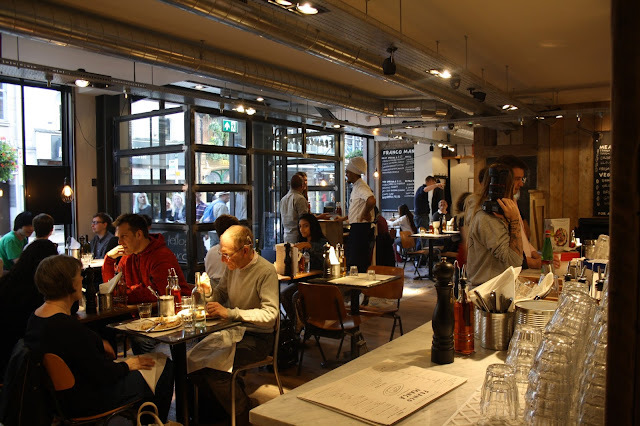 The pared-back decor which is common to all Franco Manca pizzerias gives the Oxford branch a stylish, contemporary, yet authentic feel. The wood cladding used for the walls, the caged lightbulbs hanging down, and the exposed metalwork on the ceiling produces a really unique and modern look, yet the place is still very welcoming. My favourite aspect of the pizzeria was the fact that the kitchen was located in an open corner of the restaurant, including the wood-burning pizza oven, brightly decorated with a mosaic of patterned tiles. 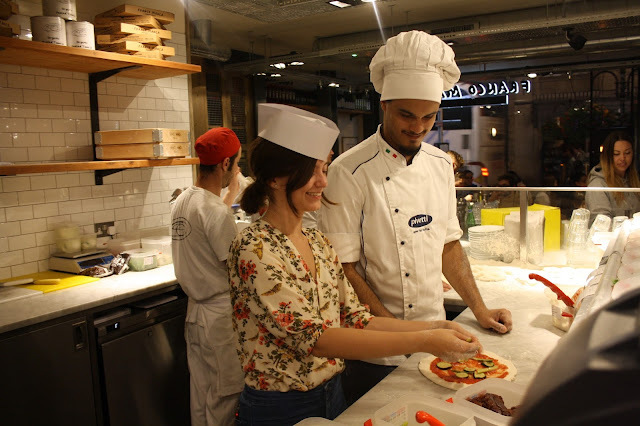 You could watch the team of chefs at work, freshly preparing your pizza, which I really loved! Having the chefs and serving team working away right before your eyes created a really bustling vibe in the whole dining area. 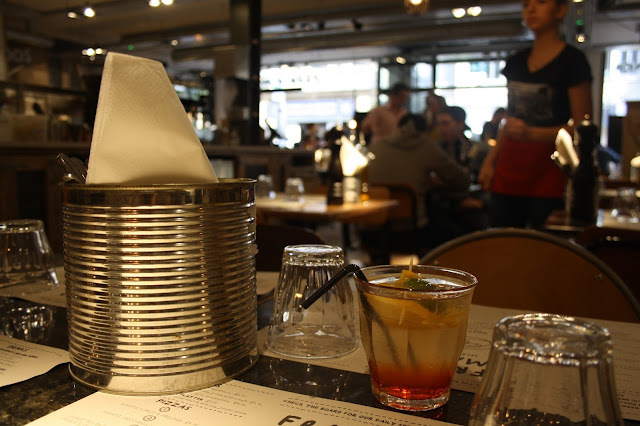 The pizzeria was packed during our visit, with queues lining up outside the door, ready for a Franco Manca feast, and this lively atmosphere made the evening even more enjoyable! Now, on to what you've really been dying to hear about - the food! 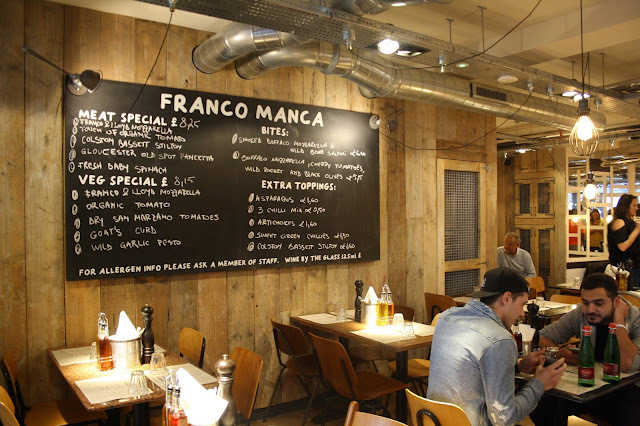 Once seated, we were served up a wide selection of treats from the Franco Manca menu to sample. For the carnivorous members of our group, there was a sharer platter of cured meat, including wild pig fennel salami! My friend Ben, who came along as my +1, assured me that the meat was of high quality and tasted divine, leaving me to try the vegetarian starter, Burrata Pugliese, which the serving team ruslted up especially for me! This dish comprised a sphere of deliciously soft mozzerella, filled with rich, milky cream. Slicing into this tempting ball of goodness and mopping up the velvety cream with the sourdough slice and accompanying fresh tomatoes and peppery rocket leaves was a truly mouthwatering experience! A must-have for any fellow cheese-lovers! For the main event, Franco Manca's unique sourdough pizza took centre stage! I tucked in to item No.3 from their menu, a delicious thin-based pizza, topped with courgette, basil, mozzerella, and buffalo ricotta. Again, the meat-eaters among us shared a tomato, mozzerella, and cured organic chorizo pizza. Both smelled absolutely amazing and the taste didn't disappoint! The crusts were crunchy on the outside yet soft and fluffy on the inside, the perfect combination. No garlic dip was needed to liven up these crusty bites! Just enough topping was placed on the pizza to give fantastic flavours without overloading it. 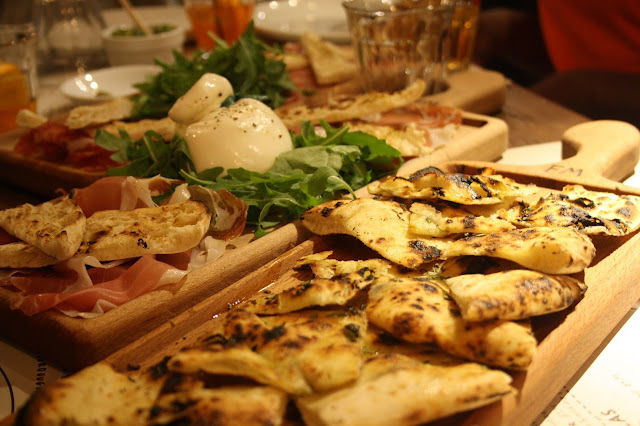 On viewing Franco Manca's menu, you may think that there are relatively few options, compared to your standard Italian restaurant menu, and while this may be true, the chefs here do what they do incredibly well. There are daily specials to supplement the regular menu, and there was definitely enough choice to satisfy vegetarians and omnivores alike. After our meal, the treats didn't stop there! 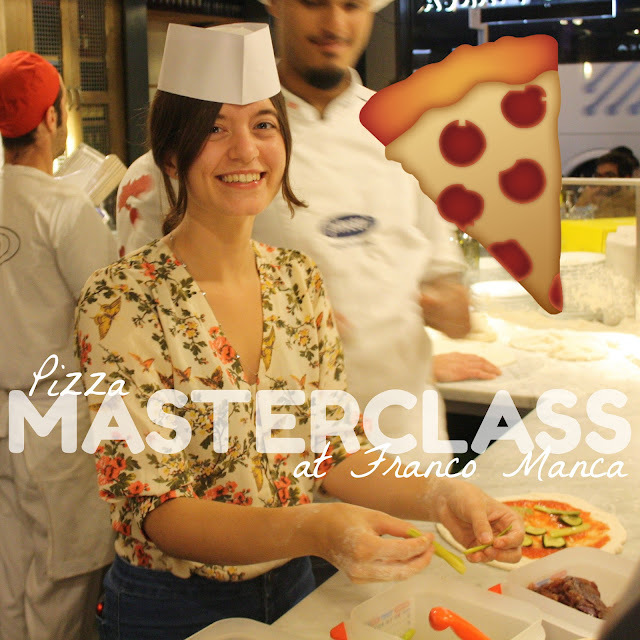 Each of the attendees was lucky enough to be given the chance to craft their very own Franco Manca pizza, courtesy of the fantastic kitchen team! We started by being given a masterclass on how the dough is made. The sourdough used for the base is a special slow-rising variety, which is left to rise for a minimum of 20 hours before cooking! 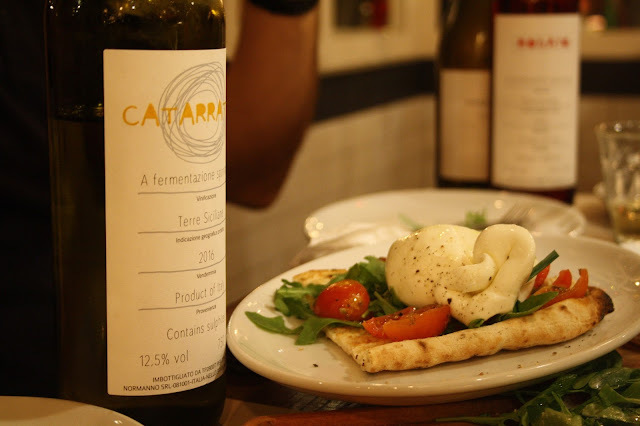 The same careful attention goes into all of Franco Manca's ingredients, including specially selecting their cheeses, the majority of which come from UK producers. I was taken through the process of stretching out the dough, spreading on the tomato base, adding toppings of my choice, and even firing the pizza! The sourdough pizzas are placed in the wood-fired oven for just 45 seconds, being adjusted by the masterchef with the paddle to ensure a uniform firing across the surface. I was so impressed by the quick and smooth process in the kitchen! Another highlight of the evening was getting the opportunity to sample the wines from Franco Manca's extensive selection. The pizzeria's wine expert was on hand to explain the intricacies of the wine list and give us an overview of the organic Italian vineyards from which the grapes are sourced. I'm a big red wine lover, so I was delighted to have the chance to try the Lambrusco Emilia from the Grasparossa di Castelvetro region, a sparkling red with full-bodied taste. I was also pleasantly surprised by the Sicilian white wine offered - I'm not normally a fan of white wines as I find them too dry, but this was delicious! You can imagine my delight when we were presented with our goodie bags to take home at the end of the event, and I found not one but TWO bottles of my favourite sparkling red inside, as well as some Italian hard cheese, pates, and cured meats! I'm excited to start cooking with them all! 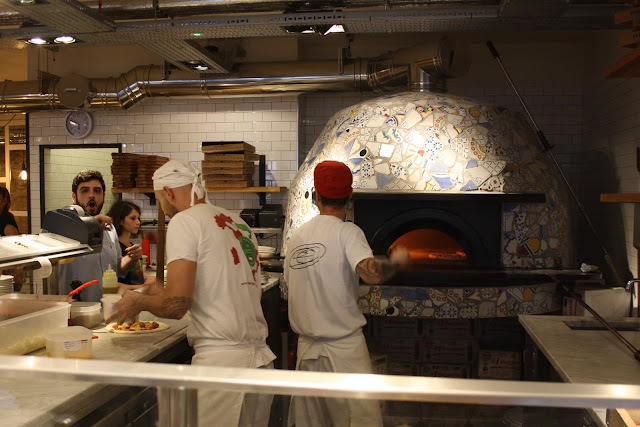 So, would I recommend a visit to Franco Manca next time you're in Oxford? Absolutely! I had a wonderful evening and I'll definitely be back. 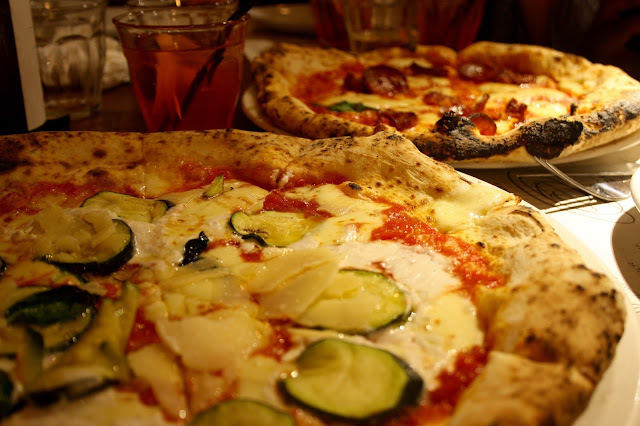 Previously, Zizzi had been my go-to for delicious pizza but now, I'll be at Franco Manca every time! 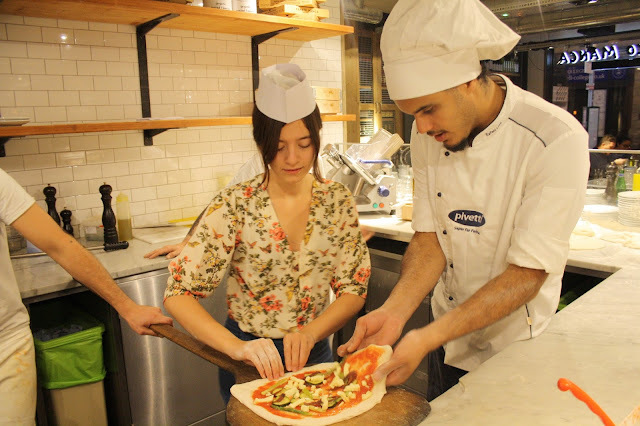 A huge thank you goes out to the fantastic team at Franco Manca for making us all feel so welcome and for providing a real insight into the ethos behind the pizzeria. Where is your favourite Italian eatery? Please share in the comments below!